Color brownish dorsally and whitish ventrally. Disc broad angular (rhomboid) with pointed corners. Snout moderate, not protrusive. Spine near base of long whip like tail. Well developed ventral fin fold on tail, dark brown to black in color. Dorsal fin fold on tail absent. Wingspan of 4-5 feet (122 to 152 cm) and weigh up to around 200 pounds. The total length, including the tail, is about 2.9 feet (90 cm). Their life expectancy is around 15 to 20 years. Inhabits coastal waters including ocean beaches, bays, estuaries, and river mouths. Generally found near shore on grass and sand/mud flats but does venture into deeper coastal waters up to ~200 feet (61 m). Benthic feeder. Feeds on bottom-living invertebrates and fishes. Aplacental viviparity (fertilized stingray eggs remain in the mother’s uterus, ingesting their yolk sacs. Once they have fully consumed their yolk sacs, the embryo is nourished by “uterine milk”), a lipid- and protein-rich fluid, secreted by the mother. Gestation period is 5 to 8 monthss. Up to 2-7 pups per litter. Observed singly, in pairs, and in aggregations. Non-aggressive species of little danger to humans with the exception of their defensive venomous barb located near the base of the tail. Avoid handling or exercise extreme caution. 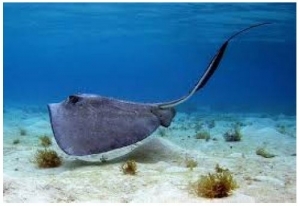 Do the “Stingray shuffle”, drag your feet through the sand when walking in shallow waters.